In this family comedy, Jim Carrey is Mr. Popper, a driven businessman who is clueless when it comes to the important things in life – until he inherits six penguins. Popper's penguins turn his swank New York apartment into a snowy winter wonderland – and the rest of his life upside-down. 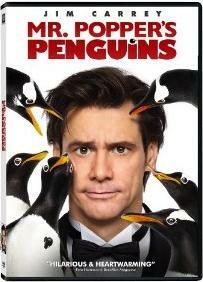 Filmed on a refrigerated soundstage with real Gentoo Penguins, "Mr. Popper's Penguins" is a contemporary adaptation of the classic book.